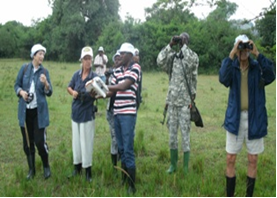 Such a great weekend out for NatureUganda members on 22-23rd June 2012! 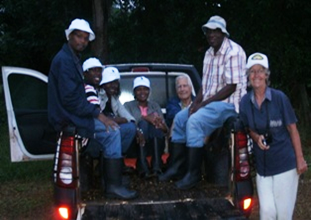 The Rhino trackers headed to the Ziwa Rhino Ranch. The weather was great, the scenery fantastic and the rhino experience exhalating. Along the Gulu highway, you are confronted with two ‘Rhinos’, a sign that you have reached the Ziwa ranch. Turn to the left, drive 3 km to the first gate and another 4km to the second gate and reception. A lot to see along this stretch including duikers, bushbucks, waterbucks, and welcome noise from the Pipiacs, the Sudan-guinea species that have recently extended their range to Kampala. In the reception compound, animals such as bushbucks and Impala both hid their tails between their legs. “You mean these animals have no tails” one member shouted. As we got nearer the animals did not move as expected of wild animals. Well not as wild as we thought but after all this is a ranch not a park. Those with snake-phobia must not meander in the compound where brown and green snakes are part of the fauna. You are restricted to walking on the concrete paths. The administration was there to receive the team and introduced us to the guide. The evening fell and a few of us ended up in the nearest watering hole ‘I mean the bar’. After a long drive to Nakasongola for nearly 4 hours, food was extremely delicious. The night was cool, the solar light was dim and the crickets ruled the night. As advised, we hit the bushes at 6.30am the next morning. First our driver requested for additional pay for game drive. Luckily one of the participants had moved with a jeep! This was even a better choice for the Rhino tracking than the covered vehicle. The drive was by an expert who would rival ‘Charlie’ (those of you who are fans of motor racing). Potholes and water ditches reminded me of my school track in secondary school. It was good we had not taken breakfast. At 7.00am we reach the Lugogo swamp, and a Pigmy Kingfisher was a good sight and calls of the Black-headed Gonoleks. One and half hours we get to the open water and we take a canoe. Along the ride you experience a diversity of water and terrestrial bird species. To the end of the water, we experience our first climate change adaptation experience. The cattle keepers cooling their milk by dipping milk container in the swamp. We missed the shoebill, but a reason to visit again. Back to reception and we had a sumptuous breakfast. Then a short drive into the ranch, we had a briefing by the ranger. One of the tricks was that when the rhino charges, just hide behind the nearest bush. The Rhino has ‘no common sense’ to check behind the bush. I am not sure that I believed him but I had to wait to put this tactic into use. I never did. We walked in line following the ranger (like police moving to stop a W2W demo). 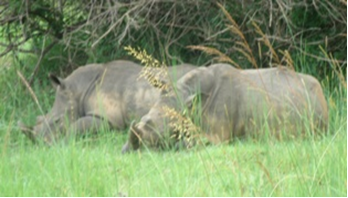 The first three rhinos were resting under a tree. What an exciting ‘ugly-beautiful’ animal, two adults and one adolescent (so the ranger says!) called Obama who was ‘celebrating’ his third birthday. This was the climax and for 30 minutes, cameras run out batteries and memory space! No one realized that we had got hungry until we reached a mango tree on our way back. Thank God, the ranger was a good climber and everyone enjoyed the juicy fruits. We could not have lunch but was instead packed for us to eat as we drove back to Kampala. A short visit but highly satisfying. The next adventure is an overnight to Ssezibwa Falls near Mabira Forest Reserve on 15th - 16th September 2012. Don’t miss! The writer is a member of NatureUganda.